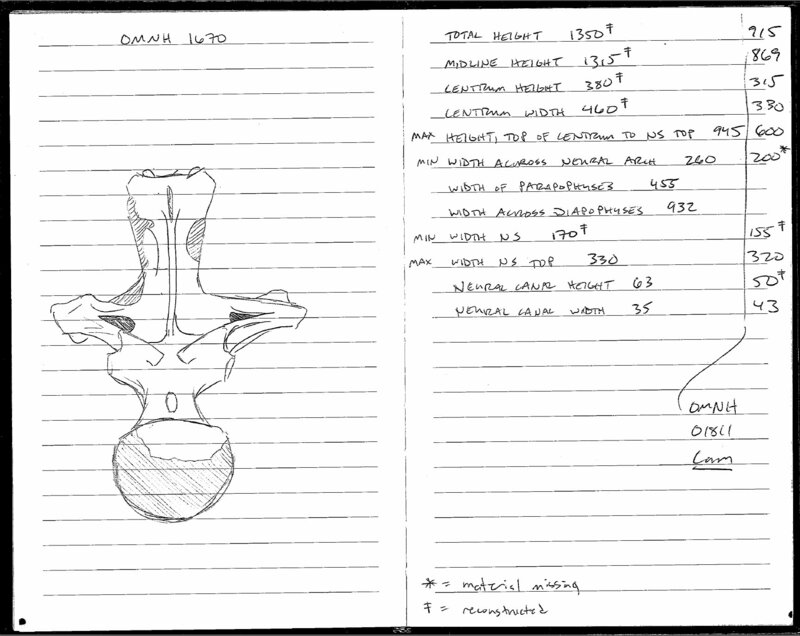 And in the second comment on that post, I promised a sketch from one of my notebooks, showing how much of the vertebra is reconstructed. Here’s a scan of the relevant page from my notebook. Reconstructed areas of the vert are shaded (confusingly, using strokes going in opposite directions on the spine and centrum, and the dark shaded areas on the front of the transverse processes are pneumatic cavities), and measurements are given in mm. Next item: is this really a fifth dorsal vertebra? 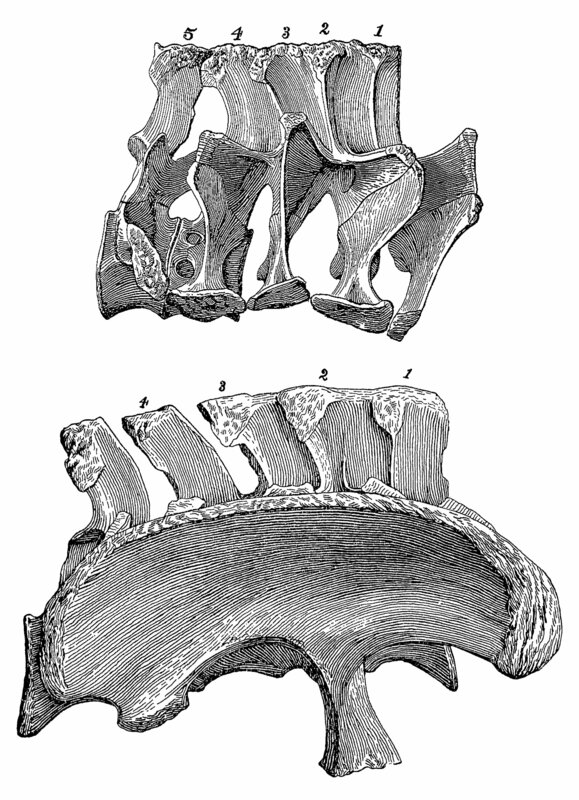 Apatosaurus louisae CM 3018 D4 and D5, in anterior (top), left lateral, and posterior views, from Gilmore (1936: plate 25). Here are D4 and D5 of A. louisae CM 3018. They sort of bracket OMNH 1670 in terms of morphology. D4 has a broader spine, and D5 has a narrower one. The spine of D5 lacks the slight racquet-shaped expansion seen in OMNH 1670, but the overall proportions of the spine are more similar. On the other hand, the transverse processes of D4 taper a bit in anterior and posterior view, as in OMNH 1670, and unlike the transverse processes of D5 with their more parallel dorsal and ventral margins. But honestly, neither of these verts is a very good match (and the ones on either side, D3 and D6, are even worse). 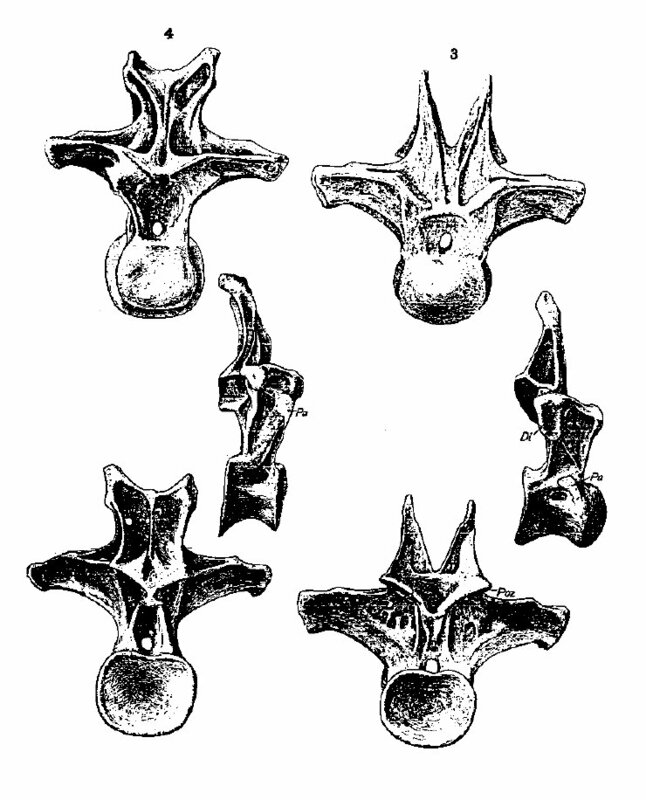 Apatosaurus parvus UWGM 15556 (formerly A. excelsus CM 563) D4 (left) and D3 (right) in anterior (top), right lateral, and posterior views, from Gilmore (1936: plate 32). Here are D3 and D4 of A. parvus UWGM 15556. D3 is clearly a poor match as well–it is really striking how much the vertebral morphology changes through the anterior dorsals in most sauropods, and Apatosaurus is no exception. D3 looks like a dorsal in lateral view, but in anterior or posterior view it could almost pass for a posterior cervical. If I was going to use the term “cervicodorsal”, indicating one of the vertebrae from the neck/trunk transition, I would apply it as far back as D3, but not to D4. That thing is all dorsal. And it’s a very interesting dorsal from the perspective of identifying OMNH 1670. It has fairly short, tapering transverse processes. The neural spine is a bit shorter and broader, but it has a similar racquet-shaped distal expansion. I’m particularly intrigued by the pneumatic fossae inscribed into the anterior surface of the neural spine–in Gilmore’s plate they make a broken V shapen, like so \ / (or maybe devil eyes). Now, OMNH 1670 doesn’t have devil eyes on its spine, but it does have a couple of somewhat similar pneumatic fossae cut into the spine just below the distal racquet–perhaps a serially modified iteration of the same pair of fossae as in the A. parvus D4. It’s a right sod that D5 from this animal has its spine blown off–but it still has its transverse processes, and they are short and tapering as in OMNH 1670. Here are all the dorsals and the first couple sacrals of FMNH P25112, which was originally described as A. excelsus but in the specimen-level analysis of Upchurch et al. 2005) comes out as the sister taxon to the A. ajax/A. parvus/A. excelsus clade. Note the striking similarity of the D5 here with D4 of the A. parvus specimen in Gilmore’s plate (until the careful phylogenetic work up Upchurch et al. 2005, that A. parvus specimen, once CM 563 and now UWGM 15556, was considered to represent A. excelsus as well). But also notice the striking similarity of D6 to OMNH 1670. It’s not quite a dead ringer–the transverse processes are longer and have weird bent-down “wingtips” (XB-70 Valkyrie, anyone? )–but it’s pretty darned close, especially in the shape of the neural spine. So what does this all mean? First, that trying to specify the exact serial position of an isolated vertebra is nigh on to impossible, unless it’s something that is one-of-a-kind like an axis. Second, after doing all these comparos I think it’s unlikely that OMNH 1670 is a D4–those are a bit too squat across the board–but it could plausibly be either a D5 or a D6. Third, I’m really happy that it doesn’t seem to match any particular specimen better than all the rest. What I don’t want to happen is for someone to see that this vertebra looks especially like specimen X and therefore decide that it must represent species Y. As I said in the comments of the previous post, what this Oklahoma Apatosaurus material needs is for someone to spend some quality time seeing, measuring, and photographing all of it and then doing a phylogenetic analysis. That sounds like an ambitious master’s thesis or the core of a dissertation, and I hope an OU grad student takes it on someday. If you were intrigued by my suggestion that the big Oklahoma Apatosaurus rivalled Supersaurus in size, and wanted to see a technical comparison of the two, I am happy to report that Scott Hartman has done the work for you. Here’s one of his beautiful Apatosaurus skeletal reconstructions, scaled to the size of OMNH 1670, next to his Supersaurus silhouette. This is just a small teaser–go check out his post on the subject for a larger version and some interesting (and funny) thoughts on how the two animals compare. Riggs, E.S. 1903. Structure and relationships of opisthocoelian dinosaurs, part I: Apatosaurus Marsh. Field Columbian Museum Publications, Geological Series 2(4): 165–196. Stovall, J.W. 1938. The Morrison of Oklahoma and its dinosaurs. Journal of Geology 46:583-600. Matt and I have been looking in more detail at indications of maturity in sauropod skeletons, as we prepare the submission of the paper arising from our response to Woodruff and Fowler (2012) [part 1, part 2, part 3, part 4, part 5, part 6]. Here is an oddity. Sacra of Haplocanthosaurus. Top, H. utterbacki holotype CM 879 in right lateral view, from Hatcher (1903:fig. 15). Bottom, H. priscus holotype CM 572 in left lateral view (reversed), from Hatcher (1903:pl. IV, part 3). To the same scale. H. priscus is the type species of Haplocanthosaurus; H. utterbacki is the second species, named by Hatcher in the 1903 monograph that described the original material in detail. As previously noted, the type species is based on adult material, and the referred specimen on subadult material. 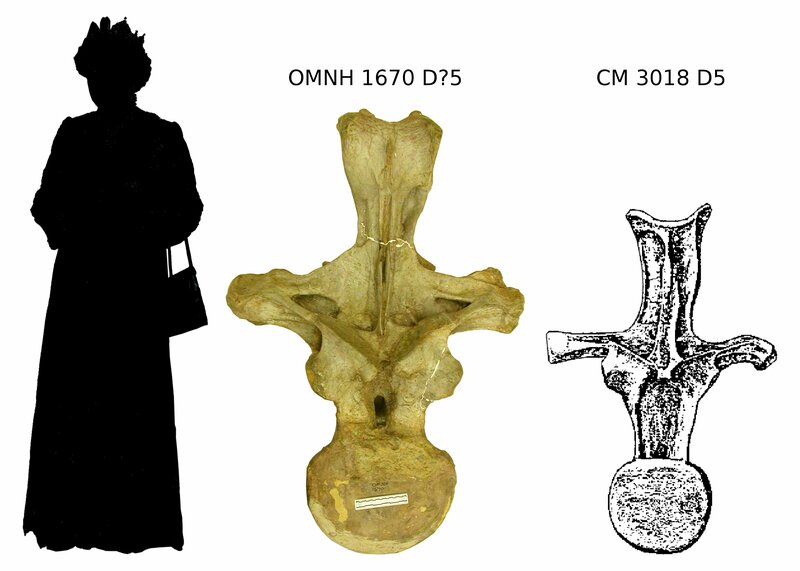 This is shown by their different stages of neurocentral fusion, and corroborated by the size of the specimens as indicated in the composite illustration above. As we would expect, the less mature of the two Haplocanthosaurus individuals is less fused in most respects: none of the centra were fused either to each other or their respective neural arches, and the ilium was not fused to any of the lateral processes, whereas in the adult all neural arches are fused to their centra, the five sacral centra are all fused together, and the ilium is fused to the lateral processes. How strange, then, that the consecutive neural spines are more fused in the juvenile! 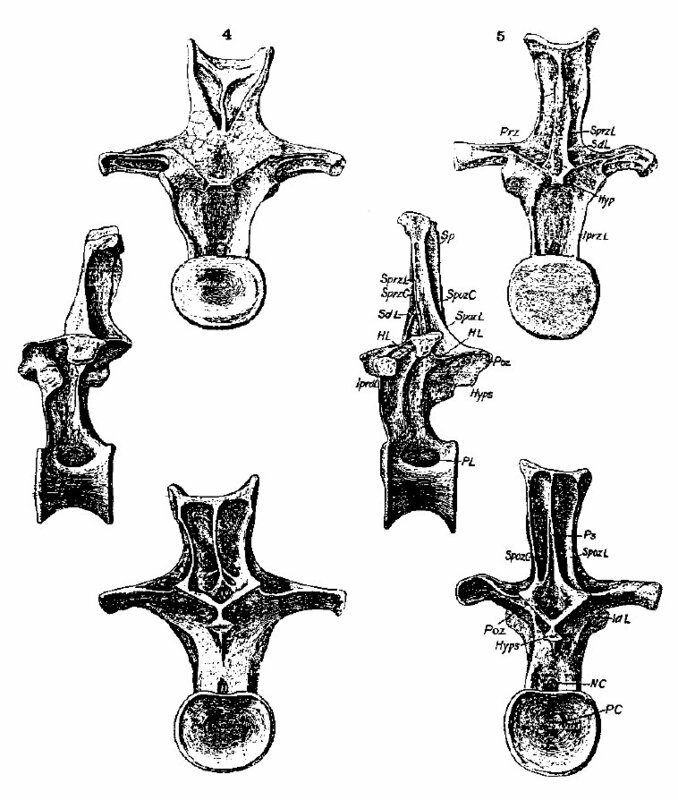 Not only are spines 1, 2 and 3 fused along their entire dorsolateral length, as in the adult, but spine 4 is similarly fused. And more: the neurapophysis of spine 5 is fused to that of 4, even though the spines are not fused more ventrally. But the most distinctive character is to be found in the sacrum which, in the present species, has the five neural spines normally coössified. The first four are cocoössified throughout their entire length, forming a long bony plate. The union between the fourth and fifth is limited to the extremities while medially [sic, presumably meaning half way up the spines] they are separated by an elongated foramen. 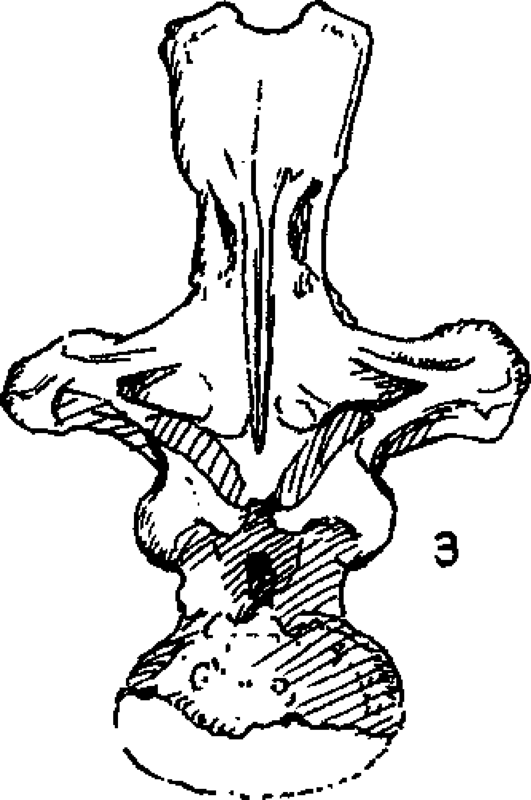 In H. priscus only the spines of the three anterior sacrals are coössified, those of the first and second [sic, presumably intending fourth and fifth] sacrals remaining free. This difference exists notwithstanding that the type of the present species was scarcely adult, the sacral centra being neither coössified with one another nor with their neural arches. By some this character might be considered as of generic importance although I prefer to consider it as of only specific value since in all other parts of the skeleton preserved, there are no distinguishing characters which could be considered as of generic value. As in CM 572 the short to moderately long spines of sacrals one through three are firmly united throughout, and those of sacrals four and five are firmly united to midheight. In CM 572 spines four and five are free, but this is probably an individual character because in the even younger CM 879 all five spines are united. All of which means: we need to be really careful when drawing conclusions about taxonomy or ontogeny from individual observations of skeletal fusion. Bonus Pneumaticity Observation: In the image at top, you’ll see that the centrum of sacral 4 in CM 879 has a couple of pneumatic fossae. For more than you probably wanted to know about those specific holes in that specific bone, see this post and the linked paper. Hatcher, J.B. 1901. Diplodocus (Marsh): its osteology, taxonomy, and probable habits, with a restoration of the skeleton. Memoirs of the Carnegie Museum 1:1-63. Woodruff, D.C, and Fowler, D.W. 2012. Ontogenetic influence on neural spine bifurcation in Diplodocoidea (Dinosauria: Sauropoda): a critical phylogenetic character. Journal of Morphology, online ahead of print. Given the huge amount we’ve written about open access on this blog, it may come as a surprise to realise that the blog itself has not been open access until today. It’s been free to read, of course, but in the absence of an explicit licence statement, the default “all rights reserved” has applied, which has meant that technically you’re not supposed to do things like, for example, using SV-POW! material in course notes. It was never our intention to be so restrictive, of course. We always wanted what we write to be as widely useful as possible; but like most bloggers, we just didn’t think about what that entailed. We are applying this licence restrospectively to all the original content on the site — not just what we write from now on. To ensure that we’re on safe ground doing this, all three of us agreed on this measure, and we also obtained consent from the only (so far) guest-blogger on SV-POW!, Heinrich Mallison. Finally, we should note the exceptions to the CC BY licence. When we’ve included material from other sources — most often figures from published papers — we do not own the copyright and can’t licence it. Similarly, all photographs of fossils held by the Natural History Museum in London are copyright the museum. If you want to re-use any of the non-original material, you’ll need to track down the copyright holders and negotiate with them. This arrived in my inbox last week, but I’ve been too busy to blog about it until now. Not surprisingly, I have comments. First, this is huge news. I am certain that Taylor & Francis, which otherwise have some of the most rapacious fees in the business, are not thrilled about taking a 38% fee cut, and that they are not doing it out of the goodness of their hearts or because they want to forge a better relationship with the vertebrate paleontology community (or whatever transparent folderol they put in their public statements). Bottom line, they’re a corporation, they have a legal mandate to maximize profits for shareholders. So there are only two plausible reasons why they might be dropping the OA publication fee so sharply for JVP: because they think they’ll make more money in the long run, or because the powers-that-be at the Society of Vertebrate Paleontology fought hard for the change. I think the first reason is a non-starter, for reasons I’ll explain below, which leaves heroism from within the Society as the hypothesis I can’t falsify. Good enough for now. SVP people who helped make this happen, whoever and wherever you are, you have my heartfelt thanks. Please don’t lose sight of that if you read the rest of the post. Article length: limited in JVP, unlimited in PLoS ONE. Impact factor: 2.241 for JVP (retrieved from here), 4.411 for PLoS ONE. Rejection criteria: your work has to be scientifically sound and also pass some threshold of general interest or importance at JVP; at PLoS ONE it just has to be scientifically sound. Publication speed: there is a lag-time between when your manuscript is accepted at JVP and when it is made public. Admittedly JVP moves pretty fast right now for paper journal, and you’re unlikely to wait more than 2 or 3 months. But PLoS ONE is faster still, posting your paper almost immediately after it’s accepted. Cost: $2000 for OA publication in JVP, $1350 for PLoS ONE. So, to sum up, if you send your paper to JVP it will have to be shorter and have fewer figures that will be in black and white unless you choose to pay extra for color reproduction, the selection criteria are more stringent but the impact factor is much lower (for now), and you’ll have to wait a bit longer–but at least you’ll get to pay half again as much for worse performance in all of these areas. That’s why this can’t be some kind of long-term strategy by Taylor & Francis to get more business–doing that requires undercutting your competitors, not overcharging and under-delivering. They’re practically driving potential authors towards PLoS with pitchforks and torches. So, although I applaud the good folks in the Society for getting a concession this big from Taylor & Francis, the publisher’s service to us is still a joke, because it is so markedly inferior but costs so much more. It’s like completing a 50-yard pass in American football…from halfway back in your own end zone. Hell of a play, dude. Hell of a play. But you’re still on the wrong side of the field. What next? Well, the good news is that the Society has been getting concessions from Taylor & Francis, so in the short term we should keep pushing for T&F to give us an OA option that is actually competitive. This is a step in the right direction, but it is just a step, and we are way behind the curve here. In the long term, I think we should think very hard about the Society’s mission. The full version can be found here, but the central kernel is, “The object of the society is to advance the science of vertebrate paleontology.” Allowing a for-profit, barrier-based publisher to put our science behind a paywall in order to enrich its shareholders is simply not consistent with that object. It doesn’t advance the science, it hurts our authors, and it hurts the people who need access to our work but can’t afford it. We should demand better. We must demand better, if we are to be true to our mission. Note that Paul Barrett, one of the Senior Editors of JVP and Co-Chair of the SVP Publications Committee, explains below that the discount on OA fees was offered by Taylor and Francis rather than negotiated by the SVP as we assumed. Matt has asked for clarification on how this went down (once, twice), but Paul says that he can’t go further into the discussions about JVP’s negotiations as there are legal and commercial implications. Left: the Queen of England, 163 cm. Middle, the Oklahoma apatosaur dorsal, 135 cm. Right, classic “big Apatosaurus” dorsal, 106 cm. To scale. Something I’ve always intended to do but never gotten around to is posting on some of the immense Apatosaurus elements from the Oklahoma panhandle. Here’s one of the most impressive, OMNH 1670, an isolated dorsal. Notice that the tip of the neural spine is ever-so-shallowly bifurcated, which in Apatosaurus indicates a D4, D5, or D6. The low parapophyses and fat transverse processes are similar to D4, but Apatosaurus D4s usually have somewhat broader spines, so I’m guessing this thing is a D5. These things vary and I could easily be off by a position in either direction. Next to it is D5 of CM 3018, the holotype specimen of Apatosaurus louisae (from Gilmore 1936: plate 25), which has served as the basis for many of the published mass estimates of the genus Apatosaurus. OMNH 1670 is 135 cm tall, compared to 106 cm for D5 of CM 3018. If the rest of the animal scaled the same way, it would have been 1.27^3 = 2 times as massive. Mass estimates for CM 3018 are all over the map, from about 18 tons up to roughly twice that, so the big Oklahoma Apatosaurus was probably in Supersaurus territory, mass-wise, and may have rivaled some of the big titanosaurs (Update: see the two giant diplodocids square off in a cool follow-up post by Supersaurus wrangler Scott Hartman). Here’s a fun rainy-day activity: take any skeletal reconstruction of Apatosaurus, clone it in Photoshop or GIMP, scale it up by 27%, and park it next to the original. It looks a lot bigger. So I’m continually surprised that Apatosaurus is so rarely mentioned in the various roundups of giant sauropods, both in the technical literature and in popular articles online. 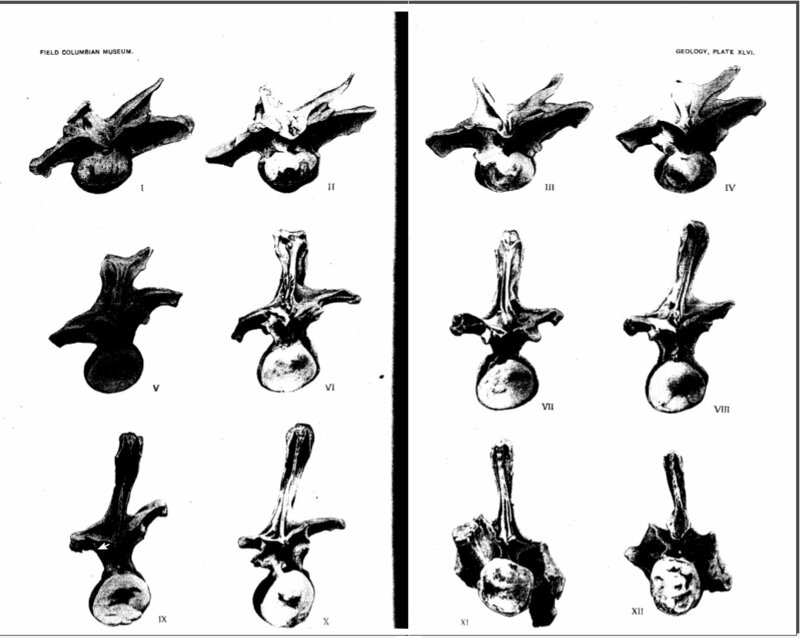 This vertebra was figured by Stovall (1938)–if I get inspired, I’ll dig up that figure and post it another day (hey, look, I did!). Fun fact: in Apatosaurus the tallest (most posterior) dorsals are 1.3-1.5 times as tall as D5 (Gilmore 1936: 201). So D10 from this individual was probably between 1.7 and 2 meters tall–not quite in Amphicoelias fragillimus territory but getting closer than I’ll bet most people suspected. NB: if you try to use the scale bar lying on the centrum of OMNH 1670 to check my numbers, you will get a wonky answer. The problem is that the vertebra is so large that it is almost impossible to get far enough back from it (above it, in this case, since it is lying on a padded pallet) to get a shot free from distortion due to parallax. For this shot, the pallet with the vert was on the floor, and I was standing on top of the tallest ladder in the OMNH collections, leaning out over the vert to get centered over the prezygapophyses, and shooting straight down–in other words, I had done everything possible to minimize the visual distortion. But it still crept in. Anyway, trust the measurements, which I–and presumably Gilmore–made with a good old reliable tape measure. Harvard University is probably the single richest school on the planet. Its endowment in 2011 was the biggest in the USA, at $31.728 billion — over 60% more than the next highest (Yale, at $19.374 billion). It’s also in with a good shout as the best university in the world — the current Times Higher Education ranking has it equal second, behind only Cal Tech, level with Stanford, and ahead of Oxford, Princeton and Cambridge. If any university should be able to pay all its journal subscriptions without problems, it’s Harvard. The Faculty Advisory Council to the Library, representing university faculty in all schools and in consultation with the Harvard Library leadership, reached this conclusion: major periodical subscriptions, especially to electronic journals published by historically key providers, cannot be sustained: continuing these subscriptions on their current footing is financially untenable. … Costs are now prohibitive. Yes, you read it right. The world’s richest university can’t afford journal subscriptions. If anyone ever doubted that subscription prices had run wild, that the academic publishers who control access to the research we generate are out of control, this should dispel any remaining illusions that all is well with the current model. Archive all their own papers as Green Open Access. Submit to open-access journals; “move prestige to open access”. Resign from editorial boards of non-OA journals if they won’t convert. Ask professional societies to take control of publishing in their fields. Recruit colleagues to join them in these measures.